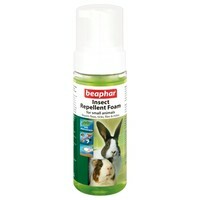 Beaphar Insect Repellent Foam is natural foam that helps protect small animals against fleas, ticks, flies and mites. It contains two natural ingredients: Margosa extract and Lavandin, both known for their insect and parasite repellent qualities. Beaphar Insect Repellent Foam is suitable for the use on small mammals and rodents from 3 months of age.